If you’re looking for a reliable round for the range or self defense, this jacketed hollow point 44 special ammo is just about perfect. Loaded with a 200 grain JHP bullet, these rounds deliver a muzzle velocity about 920 feet per second and muzzle energy of 376 foot-pounds when fired from a 5.15-inch barrel. Odds are, you’ve heard of Blazer before. Along with Blazer Brass, the brass-cased sister company, Blazer is part of the same company that company manages world famous ammunition brands like CCI, Federal and Speer. 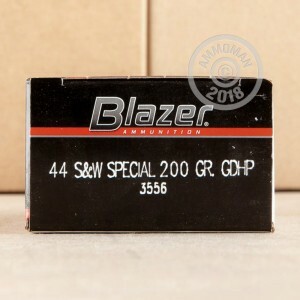 Blazer is largely recognized as a reliable ammunition manufacturer that uses quality components but is able to offer product at a very attractive and economical price. 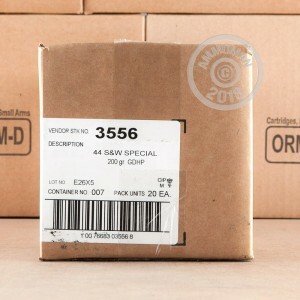 These rounds will arrive at your home packaged in 50-round boxes, with 20 boxes in this case. That packaging makes it easy to toss a couple in your range bag each week. After all, with a 44 special and it’s sometimes punishing size, your hands may not want to bear all the recoil a full case of ammo will offer in just one sitting. 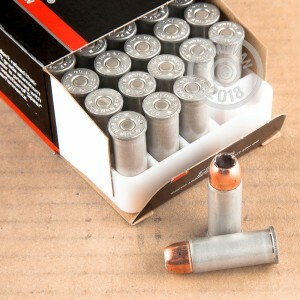 With the full case quantity, your bulk 44 special ammo purchase will also qualify you for free shipping, so you know there won’t be any unwelcome surprises at checkout!